Despite Remaining ISIS Threats, Pompeo Says U.S. Made 'Caliphate In Syria Go Away' In an interview with NPR, Secretary of State Mike Pompeo expanded on remarks by President Trump, who declared the U.S. had "won against ISIS" and would pull troops from Syria. 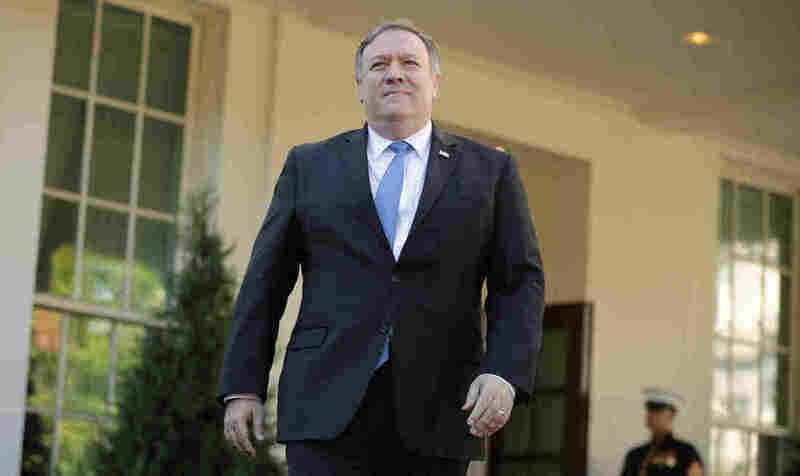 Secretary of State Mike Pompeo tells NPR that the U.S. remains committed to the Kurds, American allies in the Syrian war, even as the U.S. plans to withdraw troops from the country. Updated Friday at 9:09 a.m. ET. Secretary of State Mike Pompeo describes a U.S. fight against ISIS that is changing rather than ending, and fiercely defended the Trump administration's engagement with the world. Pompeo spoke with NPR after President Trump ordered U.S. troops out of Syria, saying ISIS had been defeated. The move troubled some of the president's supporters in Congress and appears to have helped to trigger the resignation of Defense Secretary Jim Mattis. It also prompted U.S. allies, including the United Kingdom, to note that ISIS is not entirely defeated in Syria or elsewhere. The U.S. military has reported hundreds of strikes against extremist group targets in Syria as recently as this month. Asked if he believed ISIS was defeated, Pompeo did not say yes or no. But he did make a more measured statement that the so-called Islamic State has lost its territory: "We've made the caliphate in Syria go away." He said the Trump administration remains fully committed to what should now become a counterterrorism fight rather than a military one. You can read those highlights below, or read the full transcript here. We've known from the very first trip that I took when I was in a previous role that the challenge of denuclearizing North Korea was not one that would be something that would be easy or without bumps in the road or would occur in a way that was, like instant pudding. The world doesn't quite work that way. We have diplomatically, relentlessly worked to support the president's mission statement, which is to denuclearize North Korea. We got the commitment from Chairman Kim. We've made some progress. There remains a long ways to go, but we are hard at it. Even today ... it's been a great process. They're not firing rockets. They're not conducting nuclear tests. We have a ways to go, and we will continue to achieve — to work to achieve the president's agenda. It's consistent with U.S. law and, more importantly, it is deeply consistent with ... the humanitarian protection of these migrants as they transit their way through Mexico. We will no longer permit those who are seeking asylum to remain inside the United States during the pendency of their immigration process. They'll file a claim, and then they will be returned to Mexico. The Mexican government will be, has, or shortly will be issuing a statement talking about how they will ensure that those migrants are protected and that they'll get access to counsel, visas, if they need them. This is both deeply lawful and deeply humanitarian. With respect to reducing the flow, we think this will help. We think this will [disincentivize] folks who think that if they can make the transit through Mexico — a very difficult and arduous journey where terrible things often happen to these migrants — we think they will realize that they won't be able to stay in the United States and disappear into our country.